With 3D models you see what this dinosaur looked like on the outside. 4D Vision takes you inside the body to experience the skeleton and organs. 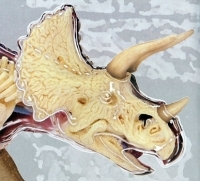 This super detailed Triceratops is 9 inches long and comes with 46 detachable organs, body parts and display stand. Also included is an illustrated assembly chart, description of the anatomy and some fun Q&A to test your knowledge. This is a great educational gift. DISCOVERY EXCLUSIVE! 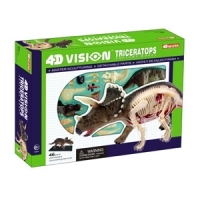 Build this Triceratops starting with the internal organs and finishing with a transparent cover that lets you see your work. This model is anatomically accurate and highly detailed. The design was overseen by an international expert on vertebrate paleontology. Includes a display platform and illustrated booklet. Ages 8+. Includes fact guide and step-by-step illustrated assembly instructions. 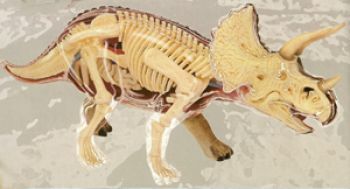 Features skeletal structure and internal organs. Assembly required. Ages 8 and up.